Sun Metals (TSXV: SUNM; US-OTC: SMTTF) has announced the final results from its 15,000-metre, 2018 drill program at its Stardust polymetallic project in north-central British Columbia. Notable intercepts from the carbonate-replacement deposit include: 1.72% copper, 0.93 gram gold per tonne and 29.1 grams silver per tonne over 5 metres from 232 metres downhole, 1 metre grading 0.59 gram gold, 382.8 grams silver and 21.22% zinc from 63 metres downhole, and 4.6 metres grading 4.17 grams gold, 34.5 grams silver and 1.6% zinc from 56 metres downhole. “Our goal was to explore the proximal part of the system and see if we could get into an area where there was a good fluid flow path that could lead to larger bodies of more continuous mineralization to give us more tonnage,” Sun Metals president and CEO Steve Robertson says in an interview with The Northern Miner. The company reported assays for hole 421 in November 2018. The hole cut 100 metres grading 2.51% copper, 3.03 grams gold and 52.5 grams silver from 517 metres downhole. The company says that hole indicates a possible extension of its Canyon Creek Skarn zone. 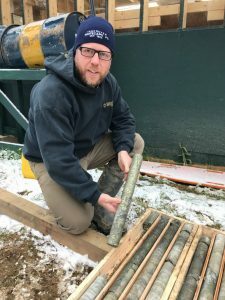 “I don’t think anyone was expecting to find the highest-grade gold mine in the world at Eskay Creek when they found it in northern British Columbia. Nobody was expecting that Chuck Fipke was going to find a diamond mine when he was scoring for diamonds in the Northwest Territories, and here we are with 100 metres of 5% copper equivalent in a carbonate-replacement system in northern B.C., where nobody would have expected that you’d actually find one,” Robertson says. Sun Metals Vice president of exploration Ian Neill holding core from drill hole 421 that returned 100 metres of 5% copper equivalent. Credit: Sun Metals. The company says the intercept may indicate a “major mineralized pathway” that leads to the heart of a high-grade system. Following up on hole 421, which lies outside the project’s current resource, is one of the company’s top priorities in 2019. The company tabled an updated resource, limited to the project’s Canyon Creek Skarn zone in January 2018. The project has 985,000 indicated tonnes grading 1.34% copper, 1.59 grams gold and 36.8 grams silver, as well as 1.99 million inferred tonnes at 1.24% copper, 1.72 grams gold and 30.5 grams silver.